From Monday 25th May, you can have an indulgent lobster dish at Dundrum's Rock Lobster for just €20. Choose from a Split Whole Lobster, Lobster Linguine or a Traditional Maine Lobster Roll. What a way to chase those Monday blues away! With Bloom starting on Thursday, the mixologist at The Marble Bar in The Westbury has created a fragrant cocktail to celebrate. The peach hued cocktail contains a combination of Tanqueray gin, lemon juice, elderflower liqueur and a prosecco float, garnished with a Pansy blossom. 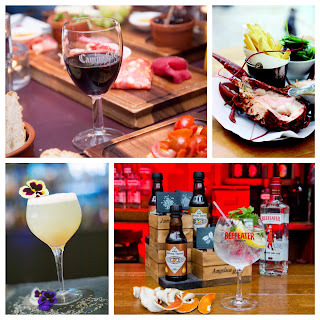 The ever-popular Campo Viejo Tapas Trail returns for another year, bigger than even with trails in Dublin, Cork & Galway. Tickets are €30 per person and include a visit to 4 tapas restaurants in each city for some delicious Spanish food and, naturally, a glass or two of Campo Viejo.